Ambre Solaire SPF 50 cream for babies with advanced mineral rich filtration system for protection against UVA and UVB rays. Ideal for babies delicate sensitive skin. Ambre Solaire Baby in the shade is an ultra-soft very high protection cream which has no added perfume and is paraben free. 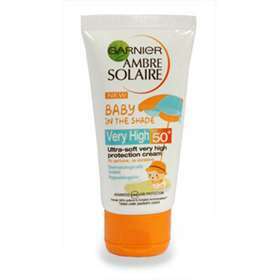 This Ambre Solaire sun cream has been tested under paediatric control. Advanced UVA and UVB protection. Keep children well covered including a hat T-shirt and sunglasses. Do not stay for too long in the sun, even when using sunscreen because it does not provide 100% protection. Apply the sunscreen just before sun exposure, re-apply frequently and generously to maintain protection especially after swimming, perspiring or towelling. Avoid the eye area, in case of contact with the eyes rinse immediately. Use sunscreen products that offer sufficient protection for your skin type. Aqua/water, glycerin, C12-15, Akyl Benzoate, Caprylic Triglyceride, Ethylhexyl salicy-Late, Bis_-Ethylhexyloxyphenol triazine, styrene/Acrylates Copolymer, Dimethicone, zea Mays Starch/ Corn Starch, Propylene |Glycol, Synthetic Wax, Diethylhexyl Butimido Triazone, Potassium Cetyl Phoshate, Tocopherol, Hydroxypropyl, Methycellulose, Stearic Acid, Phenoxyethanol, PEG-100 Stearate, PEG-8 Laurate, Triethanolamine Palmitic Acid, Ammonium Poly-Acryloyl Dimethyl Taurate, Caprylyl Glycol, Disodium EDTA, Aluminuim Hydroxide, Glyceryl Stearate.